When is the exam of IBPS this year? 56% in Higher Secondary, how can i apply for IBPS exam? Information about government job? Any test which is to be answered? Re: What is the date of Bank Jobs? Find below some of bank vacancies .Tests are in 2012.
when will the result of saraswat bank exam dated 25/12/11 declare? wen will be the result of saraswat bank, exam dated 25/12/11 be announced? - In banking sector there are numerous jobs openings. - Last date for applying is 07 January, 2012. - Exam date for clerk: 19/02/2012. - Exam date for officers: 04/03/2012. ~ KARNATAKA BANK OF INDIA is recruiting Scale-I Officers. - Applying last date is 13/01/2012. - Written exam will be conducted on 12/02/2012. ~STATE BANK OF INDIA is going to recruit 3100 Clerks. - You can apply on/before 20/01/2012. - Fee payment till 25/01/2012. - Exam will be held on 18/03/2012. ~IBPS IS CONDUCTING CWE(Common Written Exam) for specialist officer post. - Apply on/before 21 January, 2012. - Give the exam on 11/03/2012. ~UTTAR BIHAR GRAMIN BANK IS RECRUITING 406 CLERKS AND 268 OFFICERS. - Last date for applying is 27/01/2012. - Exam date: 4/3/2012 for Clerk exam and for officers is 18/03.2012. Exam date for clerk: 19/02/2012. Exam date for officers: 04/03/2012. I will provide you the some of the bank notification dates. 1. IBPS CWE Specialist Officers for various 19 nationalized banks. 2. State Bank of India: For 3165 clerk post. 3. Karnata bank : officers. 4. Jaipur Thar Gramin Bank: 58 clerks and 31 Officers. 5. Jharkhand Gramin Bank :83 Officers and 119 clerks. Last date: January 7, 2012. Online Applications are invited from Indian Citizens who belong to Scheduled Castes, Scheduled Tribes and Other Backward Classes.Before applying Online for SBI Special Recruitment Derive 2012,Candidates must under go the following details and read the complete advertisement given at the end of this page. Eligibility Criteria: Interested candidates belonging to SC/ST and OBC classes before applying must satisfy the below mentioned eligibility criteria. 12th Standard Pass with 60 % marks for OBC candidates and 55 % marks for (SC/ST) candidates. A Bachelor (Graduate) Degree in any discipline from a recognized University of India. Application Fees: A Non-Refundable Application fee of Rs 50 (For SC/ST) and Rs 300 (For OBC) candidates will have to be paid either By Offline Payment Option (Through Challan Form) in SBI Branches all over the country OR By Online Method (Through Net Banking, Debit Card etc). 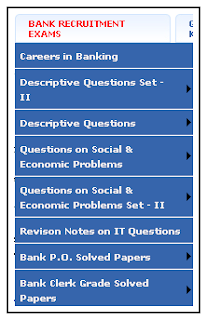 Selection Procedure: SBI will select candidates for the post of Clerks on the basis of their problems in the written test and Interview (Collectively).The Written test will be objective in nature and candidates are shortlisted for Interview based on their performance in the written test.The Short Listed candidates will be called for the Interview and final merit will be prepared by combing the mark secured in the Written test an well as Interview. - Last date for applying: 21.01.2012. - Last applying date: 20 January. 3. Karnataka bank : officers. - Applying last date- 13.01.2012. - Apply on or before 01.1.2012. - Clerk exam date: 02.02.2012. - Officers exam date: 19.02.2012. 5. Jharkhand Gramin Bank : 83 Officers and 119 clerks. - Last applying date: January 7, 2012. - Exam for clerk on: -19.02.2012. - Exam date for officers: 04.03.2012.